I’m going to show you how to remove coffee spills from your carpet. If you’re struggling with coffee spills on your carpet, relax…. it’s not as tough as you’d thing to get rid of. Here are 4 simple rules to follow. Following them will give you a great chance to get rid of the spill. First I’d like to congratulate you on trying to get rid of the scoff spills. Because most people just don’t bother. And so the spill’s quickly turn into ugly difficult to remove stains. The key to successful spill removal is speed of action. The longer you leave a spill, the greater the chance that the spill will turn into a permanent stain. This is because over time the spill will penetrate deep into your carpet fibres and become permanently bonded to the carpet fibers. Making it extremely difficult to remove without the use of specialist treatments. And in some cases it can become impossible to remove. Yeah, it’s boring when said like that. But it’s important to stay calm. You need to get hold of a clean terry towel. Yes a terry towel, not a paper towel. This is because a paper towel can start to break down and leave a mess. A terry towel will easily absorb spills and it won’t break up into soggy pieces. Step #3: Blot, Don’t Rub. 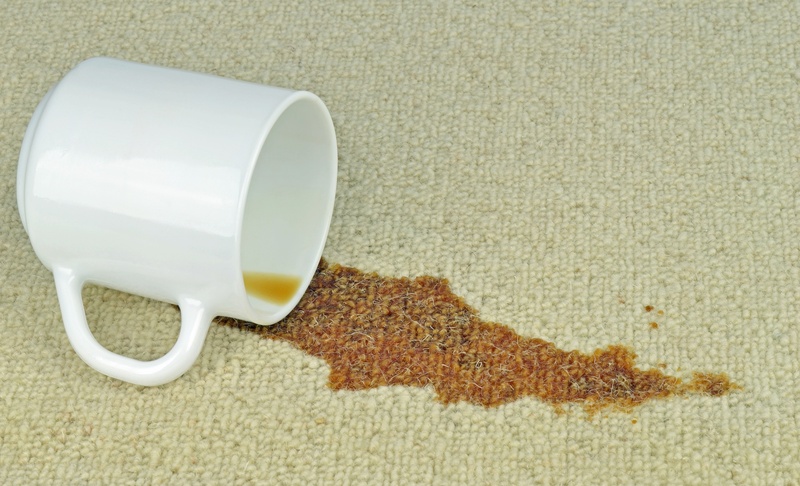 Whenever you’re treating a spill it’s important not to cause any damage to the carpet. Blotting – i.e. pressing the towel on the spill will not cause any damage. Whereas rubbing will abrade and damage most carpets, especially wool. 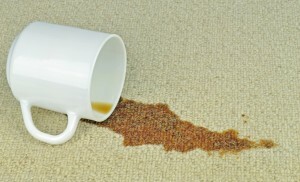 There last thing you want is to remove the spill but leave behind an obvious area of damaged carpet. If the spill is a big one, then start blotting from the outside of the spill. If the spill is a small one, then completely cover the spill. Keep blotting, using additional towels if you need to until you’ve got out all the liquid you can. Most carpets are dyed with what are called “acidic dye systems”. Coffee is an acidic colouring. This means that the coffee colour can dye the carpet, which means that detergent based cleaners can not remove the colour because it has chemically bound to the carpet fibres. So yo need a chemical reaction to remove the coffee color. White vinegar is a stronger acidic liquid than coffee. So when you apply white vinegar to a a coffee spill, the vinegar will bind to the carpet fibres and dislodge the coffee color. All you need to do is spray or gently pour the white vinegar solution onto the stain and leave it for up to 20 minutes to allow the reaction to work. After that just blot out the white vinegar with a clean towel. You can repeat the process to remove more staining. This process succeeds for about 80% of normal coffee spills. If the color is not completely removed after three attempts, then you need to call on the services of a professional carpet cleaner Phoenix. However the work you have done will give a greater chance of success. As professional carpet cleaners for over 16 years, we have numerous specialist treatments we can use to treat difficult coffee stains and other stains. If you live in our service area then please give us a call if you need any help.